Supplying tags of all kinds for over a hundred years, we at Keyes-Davis are experienced in meeting the enormous range of requirements of our thousands of customers. We are equipped to manufacture tags in a virtually limitless variety of shapes and sizes for countless applications. 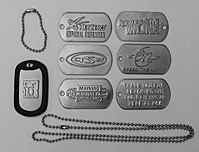 Click here to visit our catalog of large tags and small tags, including dog tags, general pet tags, bathers' or pool ID tags, laundry tags and laundry pins, mil spec tags and many varied kinds of identification tags and inventory tags. Click here to go directly to our catalog of GI Dog Tags. Large tags and name plates are available in standard gauges of brass, aluminum, steel, stainless steel, zinc, tin plate and other materials. Tags are available with one or two holes and also in adhesive backed foils and Mylar. Let us know your custom requirements. Click here to go directly to our product catalog of Large Tags. Small tags are available in a huge range of styles for every requirement, including identification tags, inventory tags, laundry tags and laundry pins, dog tags, other kinds of pet tags, property tags, bathers' and pool ID tags (see also our wrist bands), GI dog tags, parking permit tags, small instruction plates and nameplates, tags for vending machines, metal tool checks, other kinds of checking tags, tokens, and key chain tags. All of our tags are available with eyelets, attachment links, drive screws, adhesive backing, and enamel-filled characters. Tags are available with either 1 or 2 holes. Special hole sizes and special locations available. Manufacturing materials include steel, brass, stainless steel, aluminum, and color anodized aluminum. Plastic tags also available. We are happy to produce special designs and styles per your requirements - just ask us for a quote. When ordering please state style desired, quantity, hole size, material (type, gauge and color), text, layout and numbering, color if filled characters desired, along with any special instructions and extras. Consult with our staff regarding your particular application. GI dog tags provide a classic and durable setting for a variety of personalized and promotional messages and logos. Our GI dog tags are made to government specifications in stainless steel, with rolled edges. They can be custom stamped with your logo, artwork or special design, or just stamped with your specified text. These mil spec tags are also available with black silencers (to eliminate jingling). Also ask about chains in 24" (neck chains) or 4 1/2" (toe chain style).